The bones of a baby boy buried in Montana 12,600 years ago may help scientists confirm the origins of North and South America’s first peoples. The remains were discovered when a construction dig on the Anzick family property overturned a grave in southwestern Montana in 1968. Archeologists determined the boy was between 12 and 18 months old when he died, although the cause of death is still a mystery. 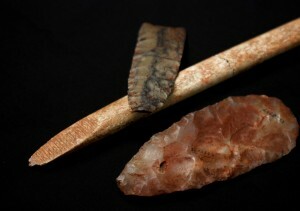 Stone knives, spear points and elk bone artifacts buried with the boy identified him as one of the Clovis people—the earliest known indigenous North American culture, which existed approximately 13,000 years ago. Archeologists had found other stone tools and artifacts from Clovis sites across North America, but the Anzick site in Montana is the only known burial site from this time period, said Michael Waters, anthropology professor at Texas A&M University. DNA analysis of the boy confirmed the child was a relative of ancient Siberian and East Asian people, concludes a study published in the journal Nature on Wednesday. Their analysis also showed that the child shares DNA with 80 percent of all modern Native American tribes, revealing that he is part of a direct ancestral line to Native Americans living today. The study affirms what native people’s oral traditions have known for centuries, said Shane Doyle, professor of Native American studies at Montana State University and member of the Crow tribe. “This discovery confirms what tribes have never doubted, that we have been here since time immemorial,” Doyle said in a press briefing Tuesday. This discovery confirms archeologists’ idea that native people of North and South America descended from people who crossed a land bridge over the Bering Strait from East Asia and Siberia. But while there were archaeological signs to suggest that was the case, there was no DNA evidence until now. For native people, the study is also a move forward toward a more cooperative relationship with archeologists, Doyle said. Danish evolutionary biologist Eske Willerslev, one of the study’s lead authors who analyzed the DNA, began consulting with Doyle and tribal councils about his findings when he suspected the boy had Native American roots. This has been a monumental shift since the 19th and 20th centuries, when archeologists and anthropologists took bones and other property from gravesites without permission from the tribe, Doyle said. “We didn’t have control over our own graves if you will. We were always seen as subjects to science rather than partners,” he said. Now he hopes native people can be seen as partners to archeologists. The archeologists involved in the study are now working with Montana tribes on a reburial ceremony for the child in the spring.